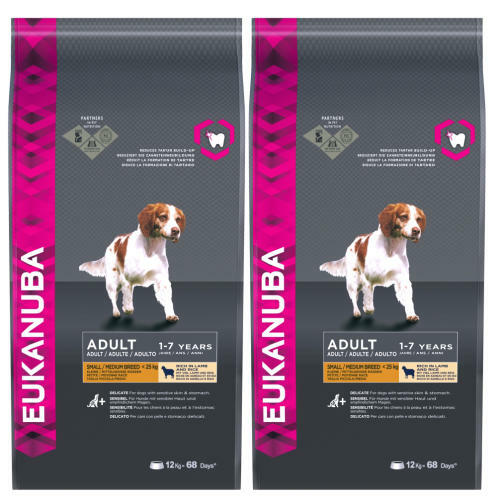 Eukanuba Lamb & Rice Small & Medium Breed Adult is a scrummy wheat-free recipe that caters to the specific and complete nutritional requirements of more sensitive dogs. With alternative sources of protein and carbohydrate for dogs with sensitive skin or tummy troubles, Eukanuba Lamb & Rice is made for dogs aged 1 to 7 years old weighing up to 25g. The crunchy kibbles help to reduce and remove tartar deposits for super sparkling gnashers, and are full to the brim of antioxidants to help support a vital immune system. Containing beet pulp as a natural source of fibre for a healthy and efficient digestive system Eukanuba Lamb & Rice for Small & Medium Adults works on the outside as well as in, with Omega 3 and 6 fatty acids for a beautifully soft, shiny coat. Dried Chicken And Turkey, Lamb (>14%), Rice (>14%), Maize, Sorghum, Barley, Dried Whole Egg, Animal Fat, Dried Beet Pulp (>25%), Chicken Digest, Fish Meal, Potassium Chloride, Sodium Chloride, Calcium Carbonate, Sodium Hexametaphosphate, Fish Oil, Fructooligosaccharides (015%. Protein 24.00%, Fat Content 15.50%, Omega-6 Fatty Acids 1.75%, Omega-3 Fatty Acids 0.20%, Moisture 8.00%, Crude Ash 6.50%, Crude Fibres 2.00%, Calcium 1.10%, Phosphorus 0.86%.